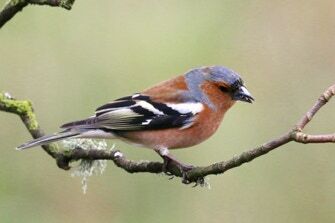 The chaffinch has double white wing bars and is a mixture of pink, blue grey, and chestnut brown with a grey blue bill. They feed on seeds and insects during the breeding season. They build a nest cup in the fork of a tree. The female incubates the eggs but both parents feed the young. 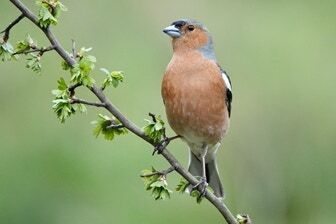 The use of chemicals in farming had an adverse effect on chaffinch numbers but they have recovered nicely. They are 15cm in length and have a wingspan of 25 to 28cm. They weigh in at between just 18 and 29g. They are seen all hear round and there are lots of them!